Life in Wyoming = Windy. It's been blowing about >40mph consistently for the last week and most days for the last month. Today it is breezy which is a welcome change--and sunny and supposed to reach 62 degrees! My days consist of getting up, going to work for 10 hours, going home, making dinner, maybe exercising, watching TV and going to bed so there is not a lot to say. I am enjoying working. I like my patients (for the most part) and I've seen some interesting things. I have treatment down for coughs, sore throats and back pain. Matthew is looking forward to joining the Navy and becoming a dentist. He has been accepted to Indiana Univ, Creighton Univ (1st year in Pocatello), Roseman Univ (in South Jordan, UT) and Western Univ (in Pomona, CA). We are going to go to the Creighton/IDEP program unless he gets accepted to Midwestern Univ in Glendale, AZ. He is being a good support for his working wife and probably struggles with boredom more than anything right now. We live in a one bedroom apartment in downtown Cheyenne. The building was built in the 1940s but was remodeled just prior to our moving in so it has fresh paint and new carpet. It has lots of closet space for its size which is good because it's definitely smaller than our Meridian apartment. It has some vintage charm with black and white tile floors in the kitchen and arched doorways. Cheyenne has about 55,000 people. It is the largest city in Wyoming. The people in Cheyenne are interesting. There is a mix of Wyoming natives, oil-field workers, military personnel and government employees. We have most of the major stores here and Fort Collins is only 30 mins away and has almost everything else. The closest Costco is in Thornton (suburb of Denver) and the closest Anthropologie is in Boulder, CO. Groceries are more expensive here but gas is cheaper (there is a refinery here in town). Cheyenne's downtown is small but has its charms. You can sense the old-west, railroad heritage of the town. We live right next to a couple of beautiful 1800s mansions. A couple of blocks from our apartment there is an old theater that plays $3 movies. Another theater near by shows old westerns during Frontier Days (in July) and serves sasperilla. There is also a newsstand/bookstore/coffee shop nearby that is a nice place to sit and look through magazines. This is the "Whipple House" and it is right across the street from us. The guy who built it started the 1st Baptist Church in Cheyenne so I don't think there is any near relation to me. It's an art gallery now. 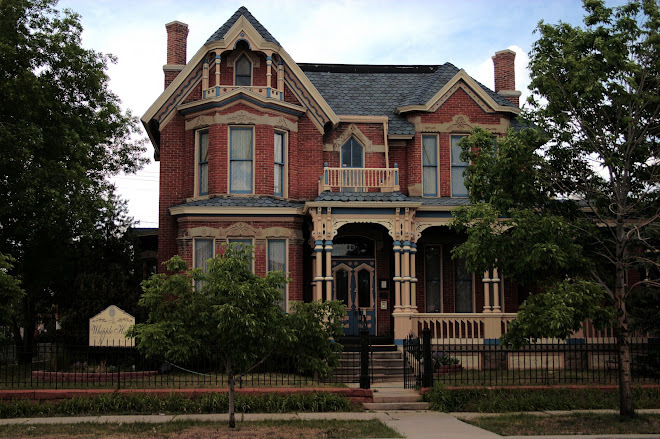 This is the Nagel-Warren Mansion and it is right next to our apartment (our windows face their carriage house). It's a bed and breakfast now. Matthew had a mini-battle with the operators over a fake handicapped parking spot that they created on the curb next to our apartment so we probably won't score a tour of the place. We went to Dinosaur Ridge on the west edge of Denver last weekend. Can you spot the dino footprints? Last week my Grandma Whipple passed away and last summer Grandpa Hurst left us. It has made me reflect on my relationship with my grandparents. As this has happened, inevitably, someone asks, "Were you close to them?" and I haven't known how answer this. Geographically, no. I've never lived closer than 3 hours from my grandparents and most of my life I have been 8 hours away. I haven't spent as much time with them as others may have spent with their grandparents. However, I have always felt close to them. As a kid we visited at least twice each year and I cherished those weeks spent running around with cousins and eating ice cream with Grandpa and Grandma. My grandparents have largely been the support that is more felt than seen. It's the kind of support that you know is there rooting for you through your successes and failures. Grandma Whipple had a severe stroke left us quite suddenly. It's so sad to be without her. She and Grandpa were such a great fit and so sweet to each other. The world has lost a wonderful, sweet, genuine person. I am sad that my children won't know her on now. I hope she can teach them to be like she is. I want them to know what a kind, giving, loving, sweet person she was. The wheels are turning on the bus and in his mind. He must know... now, Mommy. When she feels the need. She wants to intimidate other drivers. I need a sewing pattern for this. It looks perfect for summer! How do you take care of sick people when you are sick? This week is my first episode of being sick while working as a PA and it's harder than I thought. The first few days I was pulling it off--stifling a cough by clearing my throat, blowing my nose in the back room, but today I have the full-fledged watery eyes, stuffy-nose-sounding voice, look-like-death thing going. I have been sanitizing my hands about every 10 seconds but no one wants to see a PA that's sick. I need a miracle cure and some Puffs Plus...stat! Every year it is a challenge to figure out what would make a special birthday for Matthew and this year was no exception seeing as we are living in a new place and don't know a lot of peopleMatthew celebrated his 3*th birthday last week. I made a Peach Raspberry Buckle for dessert which turned out pretty tasty (if I do say so myself ;). This weekend we went to Denver for a mini-vacation. It was Free Day at the Denver Zoo so we enjoyed a winter day at the zoo which is something I've never done before. This picture of Matthew with the giraffes in the background was taken in the same spot where I was sneezed on by a giraffe as a kid. The giraffe was leaning over the rail and there were a bunch of kids standing close to get a look, then all of a sudden the giraffe sneezed cover us in giraffe snot--gross! I cried and cried but my family thought it was hilarious! It snowed on us at the zoo on Saturday and put a couple of inches over Denver. Sunday we went to the Denver Museum of Nature and Science. The 3D IMAX movie "Under the Sea" was awesome and the glasses turn anyone into a Cee-Lo look-alike. "Starting Today, We're on Holiday"
05/13/2010-Costco and Memories of Shopping Trips gone Bad!